I have been in the adventure tour business since 1986. My partner Cully and I both come from a river trip-backpacking-camping background so that influenced what we offered. When I first joined him in this business, we were running self-support kayaking trips on the Jatate River in Chiapas. We packaged dried and freeze-dried meals in our shed in Moab and Cully drove them down to Mexico, along with kayaks, lifejackets, paddles, and helmets. Guests paddled their own food and gear down this Class IV expert level river that dropped 300 feet per mile. It was a very intense trip. 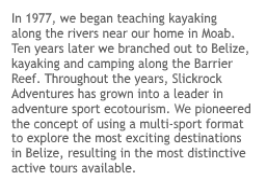 My first year with Slickrock was also our first in Belize. Cully came over here and hired a guy with a sailboat to take him down the full length of the Belize Barrier Reef. That was how he found the 5 islands we used to paddle between, starting out in Placencia. We rented a beach in Placencia and rigged from there, carrying our food, kitchen, tents, and clothing in the kayaks, packing and unpacking each day to paddle from island to island. From the beginning there was constant pressure to make it easier and cushier. In the very early years you were allowed one cup of fresh water per day to shower with. You had to wash with soap in the sea and then you took your one precious cup and poured it over your head. We had problems with people not following our instructions and they would use a lot more than that, and we would come close to running out of drinking water. We had to paddle up to 12 miles per day on that tour, but many people who signed up knowing that found that they couldn’t make it. Guides had to tow them. When I found the island at Glover’s our problems were solved. We put in shower stalls where you could pour all the water you wanted over your head, although of course it was well water, and unheated. You didn’t have to pack and unpack anymore, we had cabins! Although we only had 3 for everyone, so they were small bunk houses. Well guess what, everyone wanted more. Each year we have made it cushier and easier, and it has evolved to what we offer today. 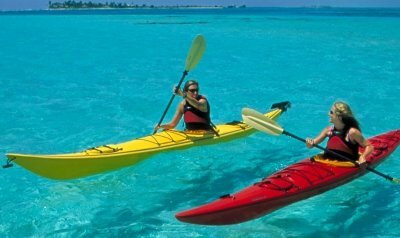 Now we offer way more sports than just kayaking and snorkeling, and we keep adding them. We are now up to 10 sports on the island, with expert guides and regularly updated gear for each sport. But you don’t have to do anything. You can hang out the whole time on the nicest island in Belize, and many people do. It’s fabulous. Families or groups of friends of all different interests and abilities can come and they are all happy. And now each couple has their own, very private cabana. We have a cooking staff, guides aren’t cooking over a fire anymore. And we have a fridge for cold beer! As much as you want! We have running rain water for brushing your teeth! We have gone upscale big time. But here I am, sitting in a $400/night suite at Almond Beach Resort near Hopkins, Belize, and I see what has been happening that whole time we have been changing with the times. The rest of the travel industry has also been evolving, along a parallel path. When we first started in Placencia, the really fancy places had one air conditioning unit, nice bedspreads, a sitting area in the room, a swimming pool, and hot showers. When I entered this suite last night for the first time, every single paper towel and toilet paper roll and Kleenix box had an origami end. Every towel was folded and twisted into a fanciful shape, and decorated with freshly cut flowers. The furnishings are as nice as the ones in my home, and it has 2 flat screen TVs and 2 jacuzzi tubs, not to mention the full kitchen, wrap around porch with comfortable patio furniture, and four air conditioners blasting at top speed. And every swimming pool has a fake waterfall. And their sport gear for the kayaking they advertise? I have seen a bunch of lodges with kayaks. Each has 2-4 sit-on-tops, and they are sitting out in the sun. No one is taking care of them or instructing anyone. And all the paddles I have seen are lousy. If I were paying $400 per night to stay here, I wouldn’t want to go anywhere. I wouldn’t want to explore the jungle all day, or go on a long boat ride out to the Barrier Reef to snorkel. I would feel I needed to sit here on my porch and look at this expensive view, or take a bath, or watch TV so I could use all this stuff I paid for. Plus, if I go down the two flights of stairs I am going to get nailed by sand fleas. It’s much more comfortable up here on the veranda. Want to go kayaking today? No thanks. I think I’ll just stay home. I always knew we were different, of course, but now I really get it. When our guests arrive on Long Caye, they barely move into their cabanas before they are in the water, snorkeling at a nearby reef. As the days progress they learn to paddle out to a patch reef and jump out of their kayaks to snorkel where it’s too far to swim. Many days we start surfing at dawn. You don’t have to worry about leaving your cabana, it’s only a simple wooden building where you store your clothes and fall dead asleep after a very busy day. There are no screens on the windows because you don’t need them. We don’t have a bug problem, and we don’t have the power for air-conditioning, but the breeze blows almost all the time out there. You aren’t paying for the furniture and the Jacuzzi tub, you are paying for the sports gear and instruction and the private island. So instead of thinking you’d better stay in your cabana to get your money’s worth, you had better get out there and have Victor whip you into shape on a paddleboard, or ask Aurora to teach you to make coconut milk for the coconut rice. That’s how you get your money’s worth. And yet, when I stay in a super fancy place, I feel like it’s a waste. It’s not me, and it’s not good for the environment. This building wiped away a whole swath of natural vegetation and wildlife habitat. I don’t like having people wait on me and act nicey-sweet to me because I’m paying $400/night. I want a real experience. I want to explore the area by kayak or swimming. I want my guides to treat me as a friend. I’m not saying that one way is better; it’s apples and oranges. There’s no point in evaluating the differences, the whole goal is different. If you want a place that is very very comfortable and you feel like a million bucks just by hanging out in your hotel room, then choose one of the villas in San Ignacio, Mountain Pine Ridge, Hopkins, or Ambergris Caye. If you want to learn new sports and get to know the locals and explore new terrain with an expert guide, we have exactly what you are looking for out at Glover’s Reef.